Breaking News for sky aficionados: Solar activity up sharply - and spots so big you can see them on simple sunset pictures! Solar activity up sharply - and spots so big you can see them on simple sunset pictures! Solar activity is now really taking off, and the monthly sunspot number values are up sharply in the NOAA diagram here - but since cycle #24 took off so late (as did important precursor events) the prognosis is still for a rather shallow maximum around 2013. There was a lot to see in recent days (and this forum alone is overflowing with images): On April 23 AR 1195 was so big that it appears inadvertendly in this simple sunset picture by yours truly! Also various hi-res H-Alpha scenes and AR 1193 in hi-res on April 20, the white light Sun on April 17, more sunset spots on April 15, a great prominence animation of April 10 and R.A.S. press releases on a coronal mass ejection on March 20, the big solar flare of Feb. 15 (also discussed here and here), the birth of a sunspot, analysis of SDO data and the solar eruption process (also discussed here); at the meeting where these came from the chance of a new Maunder minimum was also discussed. There is also a weird paper on how bacteria in India enjoyed the 2010 annular eclipse, while the webzine TOTALITY! #10 has some 40 pages on the 2010 total eclipse, including a report by yours truly. 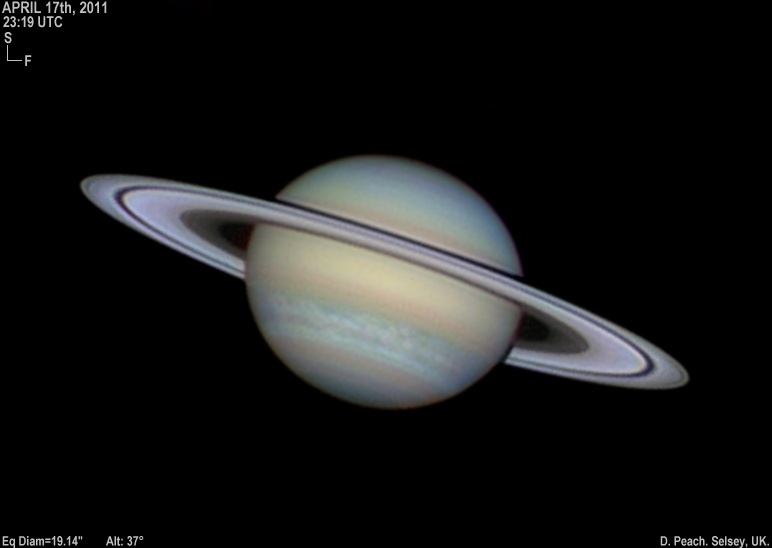 In other solar system news here's Saturn on April 17 and April 16 and the - again very big - full moon of April 17 rising and setting. The tables here are helpful in finding future perigee and apogee full moons. • A paper and another one on carbon monoxide in Pluto's atmosphere, also discussed here, here, here, here, hier, hier and hier. • Of the 2011 GP95 NEA fly-by a newer and an older video - and another interesting case coming up on June 2! • Regarding comets, a mini-video of 249P in STEREO's FOV, ideas on Main Belt Comets and the poor show so far by comet Elenin (which also got an article and a FAQ debunking related BS). This blogger also became aware of this 2007 report from the ISS where sensational comet McNaught was apparently only seen "by chance": This is a scandal, plain and simple! Beyond the solar system recurrent nova T Pyxidis has now settled around 7th mag. after brightening steadily and may yet reach 6th mag.! There are also some spectra - and IR photometry of Eps Aurigae. • The STEREO spacecraft has found a lot of new variable stars, also hailed in this and this press release. • Back on Earth three more great timelapse videos: from Tenerife (mentioned here; the light pollution is quite obvious), Mauna Kea (night of April 23 - great mountain shadow triangle and lens flares, also hailed here) and the continental U.S. (with a moving dolly). • What the AIM satellite found out about noctilucent clouds. • The ISS, imaged from Witten passing high on April 24 (parallel shot from Bonn) and rising vertically on April 23 by yours truly. • The NanoSail D is still up and seen occasionally (see also the Cosmic Mirror #341 header), sometimes pretty bright - and the reentry may not come before July. • And a long table of Easter dates: While having E Sunday on the 2nd-latest date (April 24 as this year) is twice is frequent as hitting the very last day, the two 24 Apr dates framing 2011 are in 2095 and were in 1859, the two 25 Apr dates are in 2038 and 1943, resp. - small number statistics.